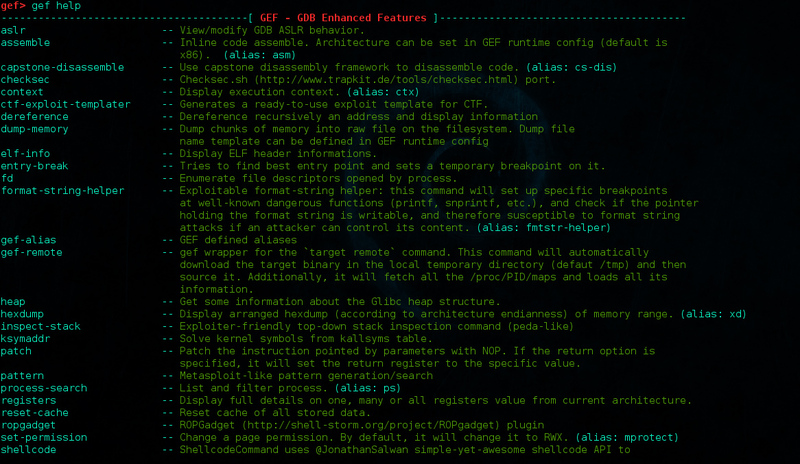 Browse: Home / gef updates – Multi-Architecture GDB Enhanced Features for Exploiters & Reverse-Engineers. — Patch Command: The patch command allows to easily bypass a call or syscall. — heap command: heap command provides information on the heap chunk specified as argument. — xinfo/vmmap/xfiles commands: xinfo, vmmap and xfiles display a comprehensive and human-friendly memory mapping of either the process or a specific location. — Remote debugging: It is possible to use gef in a remote debugging environment. — set-permission command: This command was added to facilitate the exploitation process, by changing the permission rights on a specific page directly from the debugger. 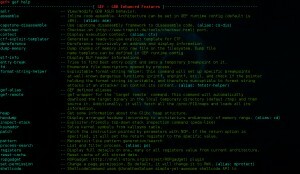 GEF – GDB Enhanced Features. The best way to use GEF is through cloning the git repository from GitHub, and source the file from your ~/.gdbinit. ← Magic Unicorn Attack Vector v2.2.